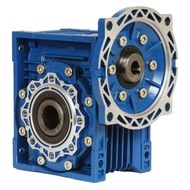 Our Aluminum (ALM) series right angle worm gear reducers are designed with metric center distances and NEMA C-Face quill style motor input flanges which allow users a much greater supply of off-the-shelf standard NEMA motor input choices. Metric center distances allow for easy installation into existing applications, while imperial output bore dimensions allow for the use of standard U.S. imperial dimension head shafts and key sizes. The aluminum housing is fin cooled and offers a greater degree of corrosion resistance not found in cast iron worm gear units.